Over the past several years, I’ve made many attempts to try to lose weight. But I wasn’t successful until about three months ago. Since then, I’ve lost almost 20 pounds and feel fantastic. My moods are better; I have more energy than ever. And I feel comfortable and confident in my skin. 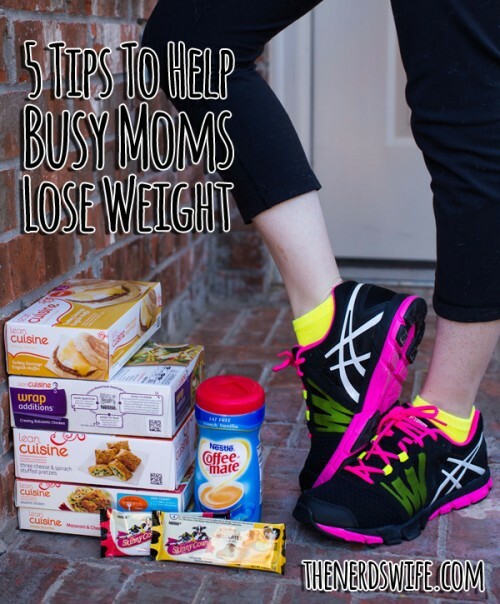 I wanted to share some of the things that worked for me, so I put together this list of 5 Tips To Help Busy Moms Lose Weight. If you’re trying to live a healthier lifestyle in the New Year, I hope these tips will help! In the past, I’ve always made vague promises to myself to go to the gym and eat better. But the whole thing just seemed too daunting. I’d drink only water — and have a terrible headache from caffeine withdrawal the next day, so I’d give up. I wouldn’t make it to the gym one day — which was a failure in my eyes — so it was even harder to go back the next time. The trick, I’ve learned, is to strive for progress, not perfection. It’s OK if one meal doesn’t go as planned, or if you miss one workout. As long as you’re doing more than you were before, you’re moving in the right direction. The key here is to drink MORE water than you were before. For me, this was one of the hardest things to do. I am an avid Diet Dr Pepper drinker. I get migraines if I don’t have one with breakfast. So the idea of drinking water instead was very off-putting. So, I made a deal with myself. For every Diet Dr Pepper I drink, I *must* drink one glass of water. When I get a can of soda out of the fridge, I also get a bottle of water. When I’m done with the soda, I have to drink the water before I can go back and get another one — 1-for-1. This formula is easy for me to follow, and I don’t feel like I’m setting myself up to fail. I’m a creature of habit. And once I get into a habit, it’s really hard for me to break. You want your weight loss efforts to become part of your life and your routine, and to do that, they need to fit into your life and your routine. If you make too drastic of a change, you could be setting yourself up for failure. If you’re someone who starts each day with a cup of coffee and lots of creamer, don’t give that up completely. 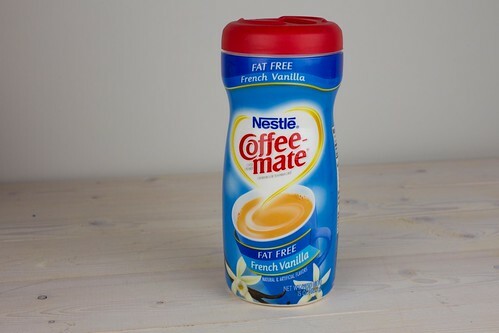 Instead, make a healthier choice with something like CoffeeMate Better For You creamer. Even if you save just a few calories each day, that’s moving in the right direction. 3. Get Up and Move! Increasing your activity level — even just by walking for 30 minutes — increases your metabolism and can help you burn calories faster. The idea is to move more than you would normally. Every little bit helps! I like to use an activity tracker to keep count and set goals for myself. The Nerd has one, too, and we have friendly competitions around it. He always seems to walk more than I do, but I usually have more active minutes. 4. 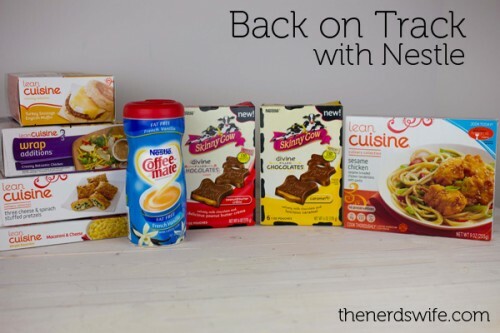 Keep Easy Snacks On-Hand. You know when you’ve been grocery shopping with an active toddler and you’ve *finally* got everything you need and you head to the check-out aisle? That’s when the craving usually hits me. You know, for chocolate. Rather than pick up a candy bar that’s right there, I reach into my purse and pull out a package of Skinny Cow Devine Candy. These candy bars are *so* good. My favorite flavor is the caramel-filled chocolate, but the peanut butter-filled ones are good, too. I love that it’s only 130 calories for a whole package — that’s three bars. And it tastes as good as the other stuff. That’s winning. We’ve all been there. You look up and it’s already time to leave to pick up the kids and you haven’t had a chance to eat lunch yet. Or maybe you’re running late so you skip breakfast, hoping to make up the time. Don’t do that. When you skip meals, your body thinks it needs to start storing fat — who needs more fat stores? I don’t. 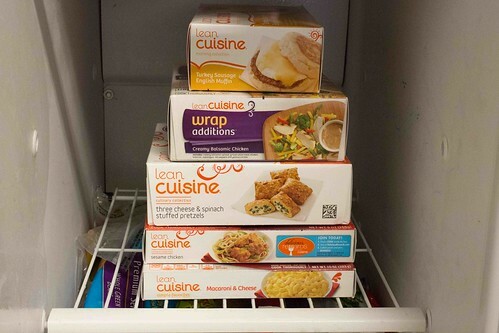 So I keep a stack of LEAN CUISINE® entrees in the freezer, just in case. I like that they have all different varieties, so it’s easy to find something for breakfast, lunch, or even a snack. And they’re yummy, too. I like to eat the Turkey Sausage English Muffin for breakfast and snack on the Three-Cheese and Spinach Stuffed Pretzels when I need an afternoon pick-me-up. And the Sesame Chicken is my favorite at lunchtime. BONUS: Stock Up Each Week. Here’s a bonus tip for you — make sure you stock up on your healthy snacks each week. As a busy mom, sometimes it’s easy to forget about yourself when you hit the grocery store. But your chances of success are greater if you already have the healthier options in the house when hunger strikes. I shopped at Walmart for all the items I’ve mentioned here — they have great prices and a wide selection of flavors to choose from. 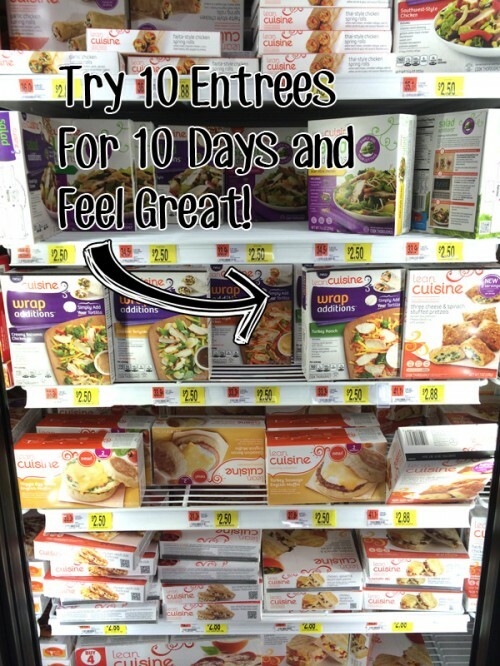 Right now, you can try any 10 LEAN CUISINE® entrees for 10 days and if you don’t believe you feel great after 10 days, they’ll refund the cost of your 10 days of entrees, up to $25 plus any sales tax thereon. Valid only on entrees purchased at Walmart. You can see the full details and download the required form here. What are some of your tips to lose weight?